Three new Nokia smartphones will soon pitch in India. 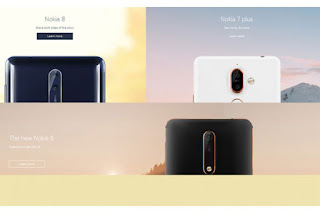 All three are Nokia 6 (2018), Nokia 7 Plus, and Nokia 8 Sirroco. Like what? Nokia 6 (2018) is known to be a refresher of Nokia 6 which was released last year. This smartphone comes with a metal unibody design. Some of the existing improvements come from the processor, where called the Nokia 6 (2018) brings Snapdragon 630 chip compared with 3GB of RAM and 32GB of internal memory that can be expanded via microSD card. Among other ranks of other specifications, this smartphone also packs a rear camera kaemra 16 MP and front camera 8 MP. The smartphone screen has a size of 5.5 inches full HD resolution. The rest of the specs include 3000 mAh battery and USB Type-C support. Will be available starting April 6, in India this smartphone sells for 16,999 Rupees or equivalent to Rp 3.5 million. Switch to Nokia 7 Plus, this smartphone comes with a more solid body with high quality construction. Inside the body of the smartphone has been embedded Snapdragon 660 chip, RAMGB, and internal memory more relieved, ie 64GB. Nokia 7 Plus already carrying dual-camera features behind 12 MP + 13 MP. While the front camera has a resolution of 16MP. The interesting side of this smartphone also comes from the display sector, which has brought a 6.0-inch screen with 18: 9 ratio Full HD resolution. Smartphone battery powered 3800 mAh plus support fast charging will be sold for 25,999 rupees (about Rp 5.5 million). Lastly there is Nokia 8 Sirocco that comes with a captivating design with edge-to-edge curved screen on both sides. This smartphone features a 5.5-inch QHD display, Snapdragon 835, and 6GB of RAM. This smartphone also has adopted dual-camera features like the Nokia 7 Plus, carrying the Zeiss brand. For the front camera, this smartphone is sustained with a 5 MP sensor. Nokia 8 Sirocco is powered with a 3260 mAh battery. The price of this smartphone is in the range of 49,999 rupees (or about Rp 10.5 million). A little extra, the third new smartphone Nokia is carrying the Android operating system Oreo. 0 Response to "Glide, This Price Nokia 6 (2018), Nokia 7 Plus, and Nokia 8 Sirocco"